Thanks for stopping by! Through one-on-one sessions, both virtually and locally in Salt Lake City, Utah, I am committed to helping you make sustainable, health-promoting changes. I practice from a weight-neutral, size-inclusive paradigm. This means that all bodies, regardless of shape and size, are valued and appreciated as is. Additionally, individuals of all genders, ethnicities, races, sexual orientations and religions are welcome here. Are you tired of dieting? Do you feel anxious when you go out to social events? Are you preoccupied with food? We know that diets don't work. Cycles of weight loss and weight gain are negative for health, both physically and emotionally. My goal is to help you ditch the diet and the food rules, and get back in touch with your body to find balance and build sustainable, health-promoting practices. 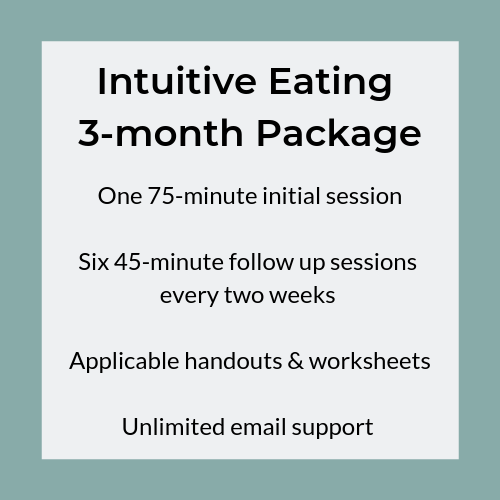 These practices will allow you to free up headspace for things that really matter in your life, and help you rediscover the joy of eating. If you want to start your journey to food freedom, and start building a healthy lifestyle, contact me to schedule a discovery call! As a former collegiate athlete, with a masters degree emphasizing in Sports Nutrition, I understand the importance of proper nutrition for optimal performance and recovery. 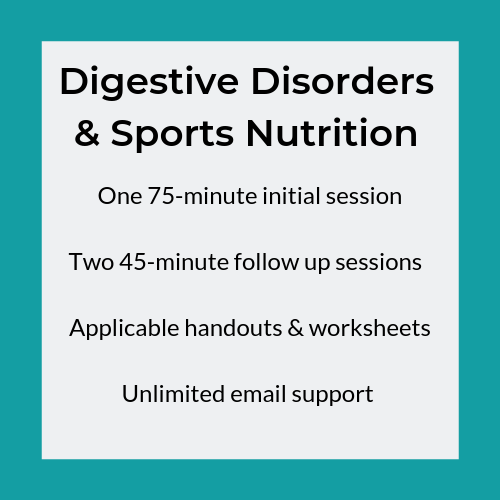 I can help you prepare with pre-race nutrition, nutrition during performance, and how to recover optimally following activity to achieve your goals. If you want to learn how to fuel your body properly and improve your performance, contact me to schedule a discovery call! I personally know the impact that a digestive issue can have on health and wellbeing. 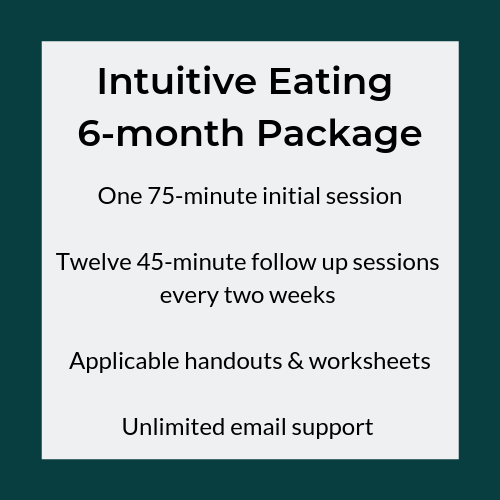 I work with my clients to find the best therapeutic diet to help foster a healthy digestive system and get them back to living their best life. Contact me to schedule a discovery call! Are you confused with what to actually buy at the grocery store? Overwhelmed by all the options and the labeling? Grocery stores can be intimidating places. Labeling can be deceiving, and advice such as "shop on the perimeter" no longer holds true. Let me help! With experience as a grocery store (retail) dietitian, I have the ability to find options that work best for you and your family. Tours include list building, how to read a nutrition label (if you want to), and how to find products that work best for you. Please note: this is restricted to those who live in the Salt Lake valley. Contact me to schedule a discovery call! Take a look at the package options above. Want something that isn't listed? Send me a message. Schedule a free 30 minute discovery call by clicking the link below. During this phone call, bring all your questions! We will chat to see if we are a good fit, and schedule accordingly. * Please note that, at this time, I do not see clients who have been diagnosed with an active eating disorder, or are under the age of 18. I am happy to refer you to someone who specializes in those areas! More questions? Check out the FAQ or send me a message!